This beamy catamaran provides lots of space for up to 20 guests to enjoy a relaxing holiday. With a large lounge bar, sun deck, jacuzzi and massage room, there is every excuse to unwind. 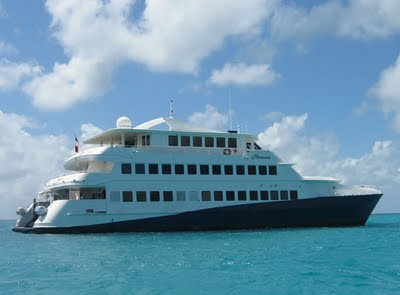 Dine aboard in the vessel's restaurant or al fresco on deck, or picnic ashore. Whatever your choice the chef will delight your taste buds with international French-Polynesian cuisine. There's something for everyone. For action packed days choose from kayaking, surfing, fishing, diving and snorkeling. Optional Haumana yoga and meditation retreats incorporating virgin beaches ensure there can be complete rest for your soul. HAUMANA's Chef will delight with delicious French – Polynesian cuisine. Meal preferences and dietary requests shall be given in advance. The restaurant features large tables of 8. Depending on the number of guests and weather conditions, dining can be arranged outdoor. The attentive Polynesian service and the local knowledge of her 12 crew guarantee HAUMANA guests the best dives, the secret fishing spots, and the most idyllic beaches, along with introductions to local specialties when requested. Guests can also participate in Tahitian dance classes, cooking demonstrations and weaving demonstrations. Explore the magical islands of Huahine, Raiatea, Tahaa and Bora Bora or the remote Tuamotu Atolls. Your charter is personalized to your requirements and can even be themed according to interests. In the Tuamotus, Rangiroa is a huge natural aquarium which lends itself to drift dives and reef drops. The abundant sea life is also ideal for fishing. Try your hand at trolling, casting from the reef or beach or HAUMANA's signature fly fishing. Rangiroa is a huge natural aquarium. Among the diversity of activities and excursions offered during your cruise, you may try yourself at different types of fishing: troll fishing, cast from the reef, line fishing from the beach or the Haumana platform and the Haumana’s signature fishing, fly fishing. Rangiroa’s immense lagoon offers fly-fishing fans a well-stocked and preserved fishing environment, and the guarantee of great catches. The favorite fish of fly-fishers are plentiful in the white-sand flats on the never-ending shoals. You’ll hook some incredible io’io (bonefish), several varieties of trevally, barracudas, milkfish(chanos chanos) and more. You’re fishing and your companion’s not… No problem at all! HAUMANA can offer a variety of activities that will keep everyone busy! In French Polynesia, Rangiroa and Fakarava are rated among the best dive spots in the world! Whether you are certified and experienced or beginner, you will enjoy the stunning beauty of the islands’ underwater world!